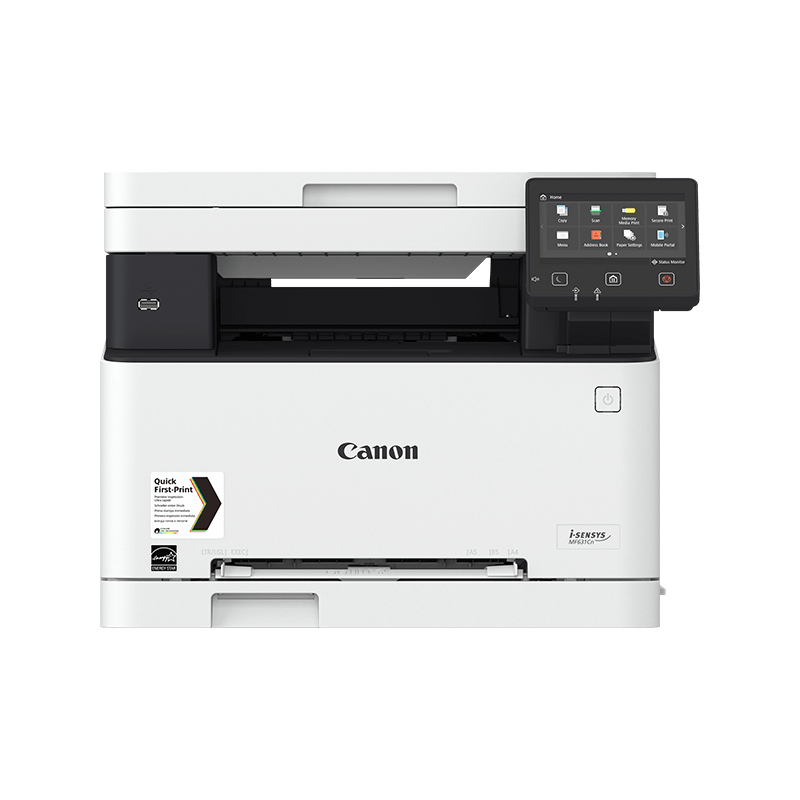 The Canon MF635CX is a multifunction colour laser printer with the ability to print, fax, copy and scan up to A4 size. It includes an intuitive touchscreen for ease of printer management, although this can also be carried out remotely using apps for added convenience. A PIN security system allows multiple users, without any loss of confidentiality. The small footprint makes this printer ideal for a small or home office. High-yield cartridges are easy to change and reduce printer downtime for maintenance, although this is let down by the low paper capacity, which means additional time may be needed for paper refills, particularly in busy periods. Measuring 451mm x 460mm x 400mm, the Canon i-SENSYS MF-635CX comes in a grey design. A 12.7 cm colour touchscreen on the front of the machine is used to manage printer operations, or this can also be carried out using apps on a mobile device. A single paper tray holds 150 sheets, and a multipurpose tray holds 50 sheets. Print speeds are 18ppm, resolution is 1200 dpi and the monthly duty cycle is 30,000 pages. Connection is achieved via a USB or network interface. With laser technology, the Canon i-SENSYS MF635CX prints to a high standard with crisp, clear text and vibrant images. High-yield ink cartridges save money, reduce the printer downtime for refills and keep wastage to a minimum. The large, intuitive touchscreen makes printer monitoring an easy task, and it is also possible to manage the operations remotely using apps, increasing workplace efficiency. A PIN security system allows for multiple users and use in a busy office with no loss of confidentiality. This printer offers two-sided scanning in one pass. Paper capacity on the Canon MF-635CX is low and is likely to require frequent refills if used by multiple users or during times of high volume printing.